I believe this is the very first semi-final I have ever reported on. I was tempted to go to the match but the comfort of my settee and Sky’s coverage won out eventually. As it turned out, I was in bed by 10:15 listening to the Scousers whining on Talkshite. Both managers selected their strongest available sides. Three hours of football from Wembley often has that effect. 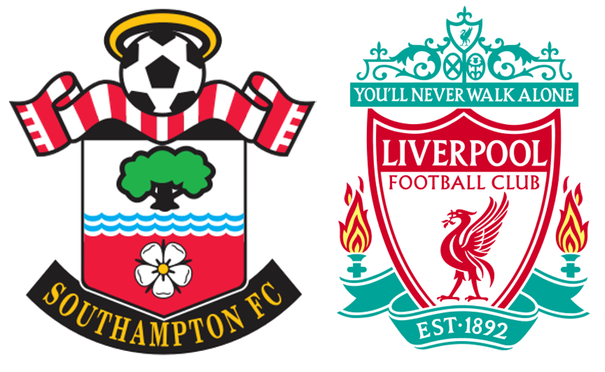 Both sides had been imperious in reaching this stage: Saints had knocked out 3 Premier League opponents without conceding and Liverpool had let in just one (a penalty) in 4 ties. Liverpool wore their 3rd kit (Toxic Thunder yellow) and selected 3 former Saints in their line-up. No doubt Mane would also have featured had he not been away with Senegal, preparing for ACON17. Saints were playing towards the Northam and early on Redmond was a whisker away from getting on the end of one of Virgil’s long range forward passes. Liverpool’s first attack saw Sturridge find Can but the German let the ball run out of play. On 4 minutes Redmond did get in. Karius spared the officials’ blushes by saving his shot as Redmond was clearly offside. The game settled into the pattern it would keep, more or less, for the full 90 minutes: Liverpool seeing plenty of possession but Saints defending manfully, closing down space in the middle and having Redmond and Tadic protecting their full-backs when the ball went wide. There was a brief scare on 10m when Virgil pulled up, holding his back. Fortunately it was not serious and the captain was soon back organising our defence. The early stages were played with no great urgency and Saints seemed content to cede possession and hope to hit Liverpool on the break. I wondered if Claude had been watching the video of Liverpool’s defeat at Burnley where they enjoyed rthe vast majority of possession but came away empty handed. On 16m Saints mustered an attack but Tadic’s cross was cleanly held by Karius. Two minutes later Liverpool finally got a shot on target. Lallana cushioned his header into the path of Firmino whose rising shot was helped over the bar by Fraser. Saints cleared the resulting corner. Suddenly Saints had a flurry of attacks beginning with Lovren’s foul on Redmond. Although the initial free-kick was cleared Saints recovered possession and sent Cedric away down the right. His cross reached Redmond whose shot was beaten away by Karius. The ball broke to Bertie who forced another save from the keeper. Moments later Saints went in front. Tadic had two goes at playing a forward pass and the second should have been safely cleared by Klavan. However the defender could not sort his feet out and the ball reached Rodriguez. His neat nutmeg on Lovren saw Redmond running beyond the defence. He collected the ball and tucked it neatly into the corner of the net: 1-0 Saints. My immediate thought was – two clean sheets and Saints are at Wembley! On 22m minutes Liverpool got Milner into a dangerous position but Forster was quick to come and claim the ball. It was noticeable that Lallana and Clyne were getting an easy ride from the home fans but Lovren’s every touch was loudly booed. The game returned to the original plot with Saints defending in numbers. Maya and Virgil kept heading the ball away and most Liverpool attacks ended when they put the ball too close to Forster and the big man claimed it. Liverpool won plenty of corners but not once did they look like breaching the red and white wall. On 28m Saints nearly broke away but a fine pass from the impressive Clasie hit J-Rod’s heel as he sprinted through Liverpool’s back line. Saints were not getting much help from the referee who seemed unable to recognise fouls commited by the men in Toxic Thunder shirts. When he eventually blew up for Lovren’s crude challenge on Tadic we heard the second biggest cheer of the night. The crowd also enjoyed Redmond’s 34m closing down of Lallana and coming away with the ball. Saints were looking rock solid and, to me at least, every home player was doing exactly what the coaches had asked him to. What made the performance special was the way we always carried a threat. On 36m Saints moved the ball upfield and J-Rod’s shot deflected for a corner. Unlike Liverpool’s string of wasted corners, Davis stuck his right in the mixer and, not for the first time, Karius came to his defence’s aid with a timely punch. Clasie quickly gathered the ball and forced another save from the German. Liverpool then returned to their siege of our box and some 3 minutes of passing ended when Firmino let the ball run out of play. Approaching half time, Saints again roused themselves and flooded forward. Karius made another important interception, fielding Davis’ cross. A minute later Bertie’s long ball reached the Ulsterman who played it off Lovren’s shins for a throw. Bertie collected the ball and swerved past a couple of defenders. His short pass picked out Tadic who knocked it beyond the back stick. Redmond met it with a firm strike, forcing Karius to make another good save. In the added minute Karius reached a long pass before Rodriguez could latch onto it. Then Cedric made a strange lofted clearance across his own box which was safely fielded by the giant Forster. Halt time: 1-0. If viewers were expecting Liverpool to come flying out of the starting box after the break, they were disappointed. Southampton surged forward and a beautiful passing move was halted by Milner’s foul on Cedric. Davis rolled the ball to Tadic whose cross came off a defender for a corner. Tadic’s lovely cross required another punch from Karius which went behind – yet the ref was happy to award a goal kick. FFS! Good preparation for visiting Anfield I suppose. Romeu was having a blinder in the centre of the park. He broke up countless Liverpool moves and calmly laid the ball off to a team-mate. Around him the others were operating intelligently, bursting upfield when they could nick the ball but filtering back when they could not. On 54m Virgil began a run down the left. He went past the whole Liverpool team but left himself too tight an angle to beat Karius with his shot. Saints looked the much better side and their hopes of hanging-on were much improved when the ref ignored Sturridge’s dive in our box. Oh course, he was not carded. After a foray down the left, engineered by Davis and Tadic, Liverpool regained possession and again camped round our box. Their increasing desperation was signalled when Lallana dragged an ambitious shot well wide. Moments later they managed their second (and final) shot on target but Forster saved Firmino’s effort. On 61m Klopp withdrew Wijnaldum, bringing on Coutinho. The little Brazilian has been a serial scorer against Saints but following a few weeks out injured he was being eased back gently. There is no doubt the change improved the visitors. Within 2 minutes Coutinho split Saints defence with a neat pass but Milner had gone too soon and was flagged offside. Saints mounted a nice move on 64m which was only ended by Clyne’s clumsy foul on Tadic. The ref chose to ignore this and then compounded his error by booking Tadic for complaining. What a prick! The flavour of the match was exactly captured in the 66th minute. A Liverpool corner was smuggled away by Cedric and Redmond. The pair sped upfield with yellow hordes trailing in their wake. Approaching Liverpool’s box, Redmond played a perfectly weighted pass through to Cedric. Sadly the Portuguese panicked. Instead of playing a low ball into J-Rod for a tap in, he went for glory and smashed the ball into the near post side-netting. On 69m Can briefly went down hurt but was able to continue. On 70m Saints were in on goal again but were again saved by Karius who held on to Bertie’s cross. Then on 73m Clasie went down with an injury. The little Dutchman had been excellent in midfield but Puel decided to replace him with Hojbjerg. It made little difference to the match as Saints continued to prevent Liverpool getting into scoring positions and regularly won their tackles to recover the ball. Liverpool still enjoyed plenty of possession but even their talisman, Coutinho, could not break through. His best effort came on 78m but his chip cleared the goal and landed in the Northam. A minute later, Saints were down the other end where Redmond’s delightful back-heel enabled J-Rod to shoot - but he missed his target. Rodriguez had run himself into the ground and a moment’s laziness earned him our second yellow when he chose to pull an opponent back rather than chase him. Saints immediately made a double substitution, bringing on Long and JWP for J-Rod and Davis. Liverpool replaced Firmino with Origi – who the Sky commentator kept reminding us had scored a hat-trick here in last season’s competition. On 83m Liverpool had their luckiest break when Long broke away on the left. His perfect cross was met by Redmond who chipped it back over Karius. The ball hit the bar and dropped onto Lovren – and out. He could so easily have sent the ball into his own net. Shame! The commentators kept reminding us that Sturridge was still on the park. He has not played badly they said: he has hardly seen the ball all night. On 85m he did get the ball and lofted another effort high into the stand. The last 5 minutes saw Liverpool continue to press. Cedric blocked a Milner cross for a corner which we cleared. Then Coutinho threaded another pass through our back line but it ran harmlessly out of play. The 4th official hoisted his board for 4 added minutes. It was a hard watch as Saints began defending far too deep. Long was in the position Romeu had occupied and everyone else was deeper. It meant we no longer had a get out ball and every clearance kept coming back. The ref didn’t help when Long was clearly fouled yet he awarded the free kick to Liverpool. FFS! Fortunately the away team could only muster a couple of half chances; Coutinho stuck the first into the crowd and, in the dying seconds, Origi cut in from the left but chose power over accuracy, blasting his shot behind the goal. The referee’s whistle was greeted by much joy. We are building up a nice little run against Liverpool: 2 wins and a draw in our last 3 matches. One more please and Saints will be back at Wembley. It is about time! MoM: Again I am spoilt for choice as several Saints players stepped up and delivered telling performances – Fraser had his best game for ages, the back four were excellent, our midfield ran the show and the front three worked tirelessly for the cause. I’m taking the easy option and agreeing with Alan Smith on Sky. Nathan Redmond is my man of the match – he got the goal, he kept getting into good positions, he ran the Scousers ragged in the middle of the park and protected his full-back like a Trojan. Well done lad – more like that and a few extra goals and you’ll surely be the next Terry Henry!